Providing educational information on flowmeters, industrial control, process instrumentation, valves, and valve automation. Posts include interesting and unique industrial control applications, new product information, and ways of improving efficiency and saving money through proper maintenance, repair, service, and re-manufacturing. 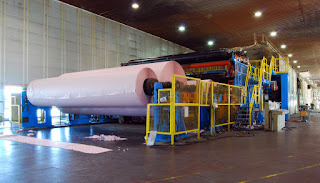 Measuring Freeness improves quality in paper production. Better quality and more salable paper is the outcome of accurately measuring freeness at the beginning of the manufacturing process. Controlling freeness makes production lines more efficient and capable of producing better quality paper at a lower cost per ton. According to the North Carolina State Mini-Encyclopedia of Papermaking Wet-End Chemistry, freeness is defined as “a measure of how quickly water is able to drain from a fiber furnish sample. In many cases there is a correlation between freeness values and either (a) a target level of refining of pulp, or (b) the ease of drainage of white water from the wet web, especially in the early sections of a Fourdrinier former. Standard tests of freeness are based on gravity dewatering through a screen. The devices are designed so that an operator can judge the speed of dewatering by observing the volume of liquid collected in a graduated cylinder. Freeness tends to be decreased by refining and by increases in the level of fines in the furnish. Freeness can be increased by use of drainage aids, removal of fines, or enzymatic treatments to convert mucilaginous materials into sugars." TECO (Thompson Equipment Company) has been serving the pulp and paper industry for over 60 years, and has helped hundreds of clients with their unique Drainac® Drainage Rate Indication System. The Drainac® is an on-line instrument that continually measures the drainage rate of pulp and provides a proportional 4-20 mA DC signal. The unit consists of two major sub-assemblies; a detector and a detector control cabinet. It has earned a reputation as the fastest, lowest cost, and most pain-free device of its kind for measuring freeness. Closed Loop Refiner Controls – On-line freeness measurement is commonly used to control the final freeness target (setpoint) for the refiners by cascading the freeness measurement output directly to the horsepower tons / day controller. Basic On-line Freeness Measurement – Basic on-line freeness measurement is used by production managers and paper machine operators as a “speedometer” of fiber quality enabling them to make real- time decisions that effect final production quality and paper machine run-ability. Stock Blending – Used for monitoring the fiber characteristics of individual furnish streams so that optimal stock blending can be accomplished on a real-time basis. In this manner, the lower cost furnish stream can be maximized without sacrificing final product quality. Please watch the video below for a better understanding of why its important to measure freeness for improved paper quality. For more information on freeness measurement, visit http://www.drainac.com or call TECO at 800-528-8997. Headquartered in New Orleans, Louisiana, the Thompson Equipment Company (TECO) engineers, designs and applies industrial process instrumentation, provides calibration and field repair services, manufactures special purpose flow instruments, remanufactures all brands of flowmeters, and provides industrial valves and full valve automation capabilities.